The idiom “take it with a grain of salt” implies not to take something seriously—but in the chemical processing world, salt is a serious ingredient. Almost half of the world’s chemicals depend on chlor-alkali products, which come from salt. Chlor-alkali processes introduce current into an aqueous/salt brine to produce chlorine and caustic soda (sodium hydroxide). Three methods exist for this process: membrane cell (81 percent of global production); diaphragm cell (14 percent); and mercury cell (5 percent of global production, mostly in Europe). Chlorine is used to make bleach and more than 15,000 commercially traded compounds. Major markets such as plastics and pharmaceuticals require chlorine for their manufacturing process, even though chlorine does not end up in their finished products. Chlorine is a major component in the vinyl chain, which is tied to the construction industry and makes up about 30 percent of global demand for chlorine. Chlorine is the most widely used chemical in the world. Caustic soda (sodium hydroxide) is a basic ingredient for paper, textiles, detergents and most forms of industrial and municipal water treatment. The end-use markets for caustic soda are more numerous than those for chlorine, and in many applications caustic is valued more for its neutralizing power as a strong base and an absorbent. One of the top global markets for caustic is aluminum production. Other significant markets include pulp and paper, and production of organic and inorganic chemicals driven by the manufacturing sector. Caustic soda is the third-most popular chemical used throughout the world. Chlorine is a reactive element and a strong oxidizing agent. It is toxic and corrosive, irritating eyes, skin and respiratory systems. Chlorine cannot be inhaled by plant personnel. It is harmful to the body’s moist tissue, particularly the lungs, even at low concentrations. The transportation of chlorine (via rail or pipeline) is dangerous and is highly regulated. Depending on the concentration, caustic soda can be corrosive, irritating and potentially fatal to plant employees (if high quantities come in direct contact with the skin or mouth). As a result, industrial manufacturers of this chemical use closed systems to prevent direct contact with plant employees. The wastewater from chlor-alkali production causes environmental problems. The mercury cell process is the least friendly to the environment, harming fish, birds and anything else (including humans) that consume fish. Although the mercury process is being phased out, approximately 5.3 million metric tons (or 5 percent) of chlor-alkali products are still produced each year via this method. Diaphragm cell technology uses asbestos as a separator material. Several world agencies have eliminated asbestos from most industries, but the chlor-alkali industry remains exempt in many regions. Regardless of the method of production, all forms of chlor-alkali production emit pollutants that negatively impact humans, wildlife and the environment. External emissions are one of the biggest issues relating to pumping equipment used in chlor-alkali production, so sealless pumps are required to move catalysts and materials through each stage of production. Sealless pumps have no seals to replace, which can mean fewer (or no leaks) and may also mean no emissions. 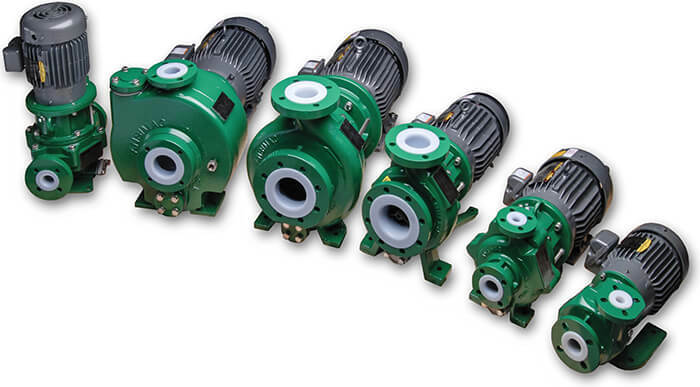 To lower the total cost of ownership for plant equipment, construction materials are key in pump selection. The harsh nature of chlor-alkali production can wreak havoc on infrastructure. Some chemicals used as catalysts (such as sulfuric acid to dry moist chlorine gas) add further demands on pump linings and render expensive alloys such as titanium or palladium/nickel unusable.